Meeting in Budoia with a guide for visiting Polcenigo, a small “borgo”, one of the most beautiful medieval borgo in Italy. Stop at Gorgazzo, a site of great naturalistic value with the source of water sprinkled in the cracks of the Cansiglio and Piancavallo mounatains that reappearing on the surface. Than a visit of the "Santissima", one of the main sources of the River Livenza. The tour continue towards a local wine cellar for a tasting of typical local wines with buffets. After the buffet departure for Sacile, the "Giardino delle Serenissima", so called for its Venetian atmospheres that are noticed by the architecture of the elegant lagoon style palaces that mirror the blue waters of the river. After a walk through the bridges meeting with the federal canoa instructor to begin the 1 km tour through the Sacile canals. The tour is about 40 minutes long, necessary equipment will be provided (canoe, paddle and life vest). 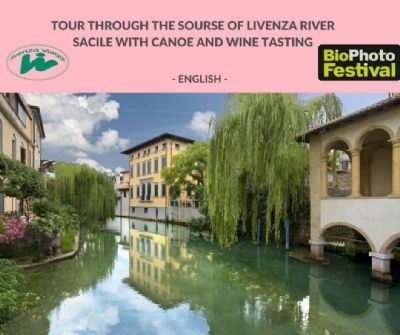 To follow the river course with the canoe means moving through the territory and relive the antique route to Venice. Return to Budoia at the end of the tour.